Buy by the case and save! CLICK HERE. Leak-proof double seal ensures safe transport of samples. 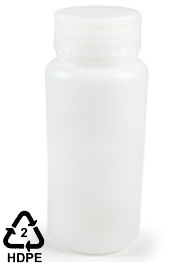 This economical wide mouth 250mL (8oz) HDPE round bottle has a rigid polypropylene (PP) double-seal closure designed to prevent leakage. Not autoclavable. Great for use as a long term storage container. No-drip pour lip for safe and clean dispensing. Heavy wall to withstand years of abuse. Extra wide opening provides easy filling of solid materials. 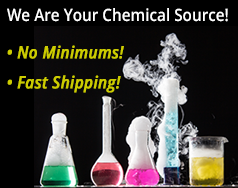 Alcohols, select acidic and basic solutions.